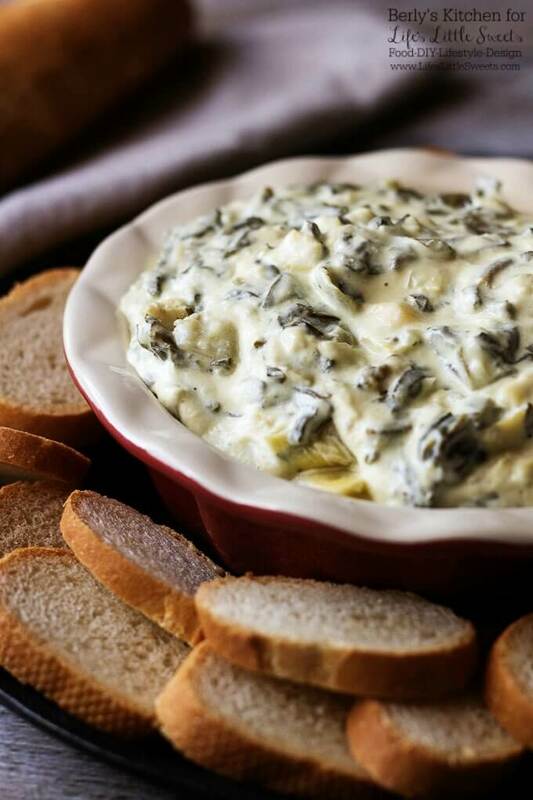 Try our simple spectacular spinach artichoke dip made with three kinds of cheese. It’s cheesy, warm, and delicious! 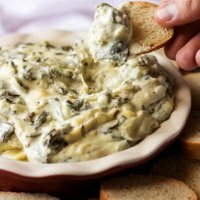 Everyone loves a great spinach artichoke dip; however, these kinds of party dishes can be messy and time-consuming. Fortunately, we have created a recipe that solves both those problems without sacrificing any of the flavors you’ve grown to love. It’s cheesy, warm, and delicious and we know you won’t be disappointed. No matter the get-together or party, everyone loves a great dip. 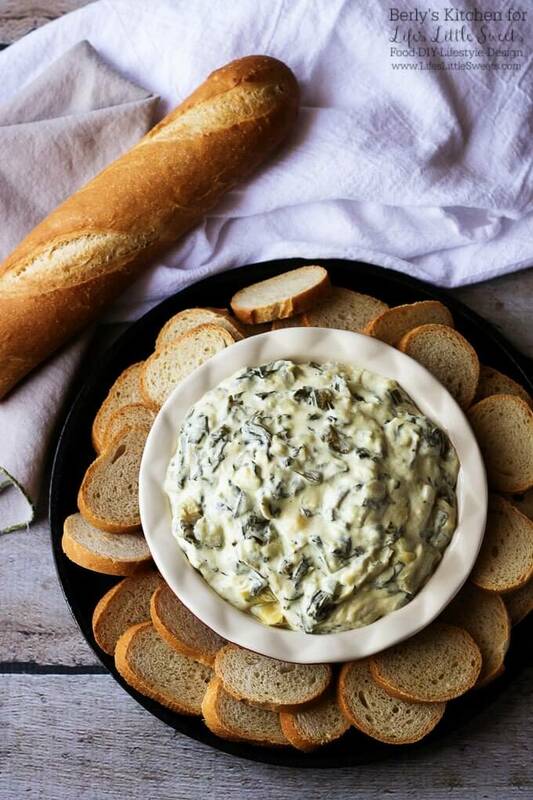 When you ask people about their favorite hot dip, the usual answer is spinach artichoke dip. But like I said above, it can be a pain to prepare. Luckily, this recipe takes out all the fuss. In just three simple steps, you can create a scrumptious offering loaded with melted, creamy cheese. Simplicity is the key to this dish. All you need are the ingredients, a slow cooker, and serving dishes. It only takes about two hours to make everything. Since you don’t have to babysit the cooking process, you can start it a little while before your dinner party is set to begin. In the end, this spinach artichoke dip recipe ends up saving time because you don’t have to monitor it as it cooks. You can wash up the few dishes that were used and move on with your day as it slowly simmers in the slow cooker. 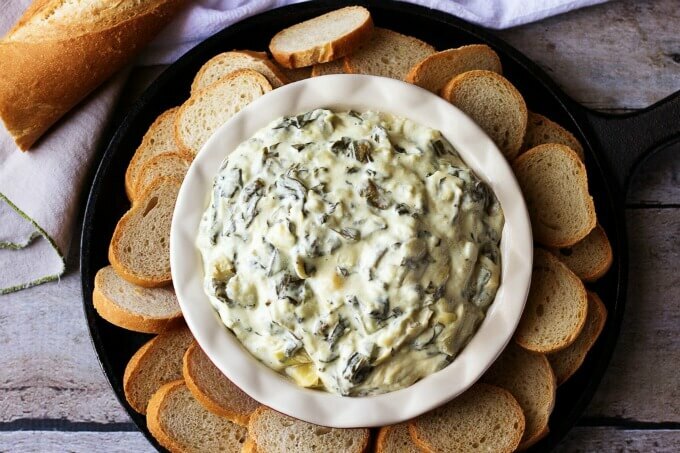 Once it is done, you have this amazing, gooey dip. Just slice a French Baggette into bite-sized pieces, and you have the perfect vehicle to drive all that flavor to your taste buds. In closing, I invite you to try this recipe for yourself. I doubt you will find an easier dip with this kind of luscious taste and texture. 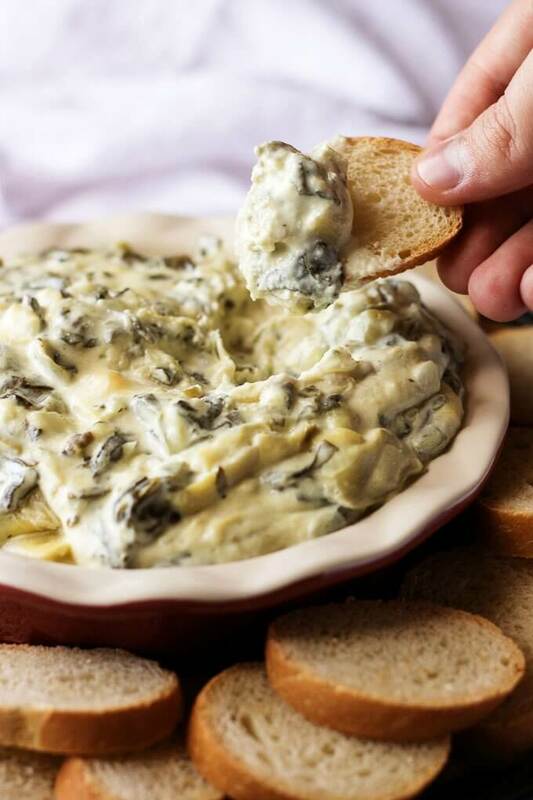 Try our simple spectacular spinach artichoke dip made with three kinds of cheese. It's cheesy, warm, and delicious! First, combine all the ingredients in the slow cooker and stir them to mix everything together. Next, cook the dip on high heat for two hours, stirring occasionally. Last, transfer the warm dip from the slow cooker to your serving bowl and serve it with sliced bread, crackers, or any other dipping food you may desire. The calories listed are an approximate amount based upon the ingredients listed and 10 to 12 two ounce servings. It should be noted the dip can cook for about three to four hours on low heat or two hours on high heat. Please remember to stir the dip occasionally during the cooking process.